Secondary-level chemistry teachers will participate in 45 hours of on-line training in Chemistry: Modeling Instruction. The course will focus on an evidence-based approach to the internal structure of the atom; periodicity and covalent bonding; intermolecular forces; equilibrium; and acids and bases. 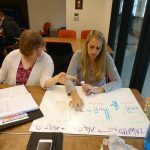 The goal of this Modeling Methods course is to provide a meaningful form of professional development for in-service teachers using student-centered, inquiry-based, constructivist practices. Participants will frequently be asked to play two roles (student and teacher). First, outside of class meetings, participants will be asked to take the role of a novice student in chemistry (similar to their actual students) as they perform all the laboratory investigations and problem-solving that such students will be asked to do. A taxonomy of common preconceptions and misconceptions students hold will give participants a useful perspective from which they will be better able to address their own student’s learning obstacles. 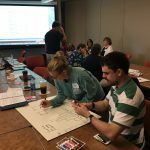 Second, participants will be asked to play the role of the classroom chemistry teacher where they will observe and discuss the techniques of managing student discourse, using Socratic dialogue, and general classroom management in an inquiry-based classroom. Throughout the course, teachers are asked to reflect on their practice and how they might apply the techniques they have learned in the course to their own classes. The principles learned here can be readily transferred to any other sort of classroom instruction. The Spring Distance Learning courses will be conducted via Zoom. Each class will meet for 3 hours once a week for 15 weeks. The classes will also require an addition 3 hours of homework each week. wendy@modelinginstruction.org. Full payment or a $75 non-refundable deposit must be made by December 21st to secure your seat. You will be invoiced for the remainder to be paid in full by January 15, 2019. Workshop tuition costs and the deposit will be refunded 100% if the course is canceled. A 50% refund be given for withdrawal from the course after January 15th until the course begins. Once the course begins, no refund will be given. Fees are processed in the United States. If you would like to pay with Purchase Order (PO) from your school also email amtaexec@modelinginstruction.org for invoice creation. The PO needs to be delivered by December 21st to save a class seat. Payment for the course by check is preferred.